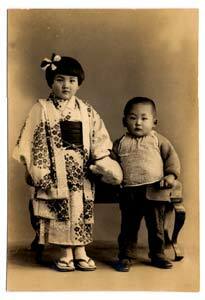 Shinichi Tetsutani (then 3 years and 11 months) loved to ride this tricycle. That morning, he was riding in front of his house when, in a sudden flash, he and his tricycle were badly burned. He died that night. His father felt he was too young to be buried in a lonely grave away from home, and thinking he could still play with the tricycle, he buried Shinichi with the tricycle in the backyard. In the summer of 1985, forty years later, his father dug up Shinichi's remains and transferred them to the family grave. 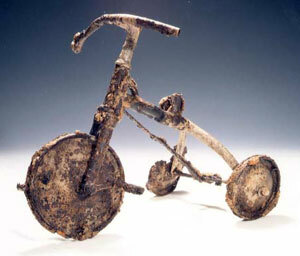 This tricycle, Shinichi's best friend, was donated to the Peace Memorial Museum.